1.5 Gallon Kit #2, System Three General Purpose Epoxy with Medium Hardener, Kit includes 1 gallon of epoxy and 2 quarts of hardener. 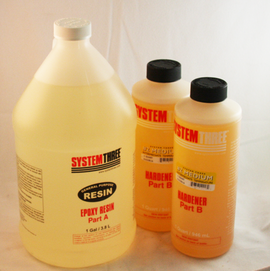 System Three General Purpose Epoxy is a time proven workhorse that is available in 3 hardener speeds, fast, medium, slow. Originally developed for wood epoxy boat building it has great adhesive properties an is very flexible. Works great for making putties and as a hand lam resin. Pot life at 77F is, 15 min for fast, 30 min for medium, 70 min for slow. For more information on working with epoxy System Three's Epoxy Book is available online. The MSDS sheet for System Three General Purpose Epoxy and Hardeners is available here. 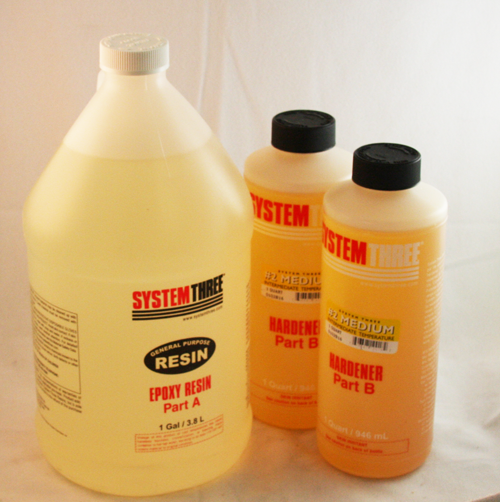 The System Three General Purpose epoxy resins and hardeners are considered NOT hazardous for shipping, we can ship this particular resin system via air and internationally via post.